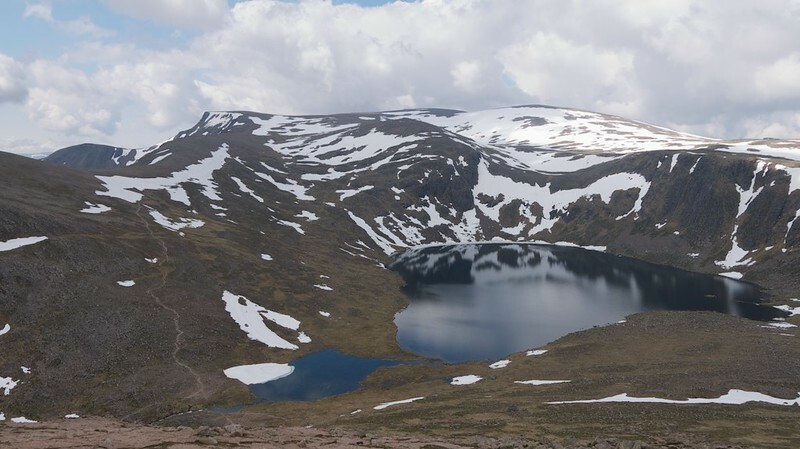 We didn't set off from the Linn of Dee car park until gone 11am, despite our intention to walk up Beinn a' Chaorainn in the heart of the Cairngorms. 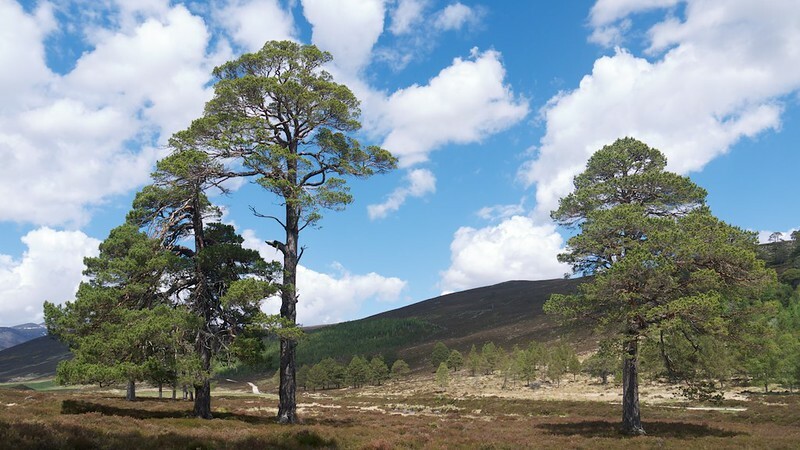 Not having to worry so much about timescales is the beauty of the bivvy, I thought to myself, as we walked through the woodland and up Glen Lui. 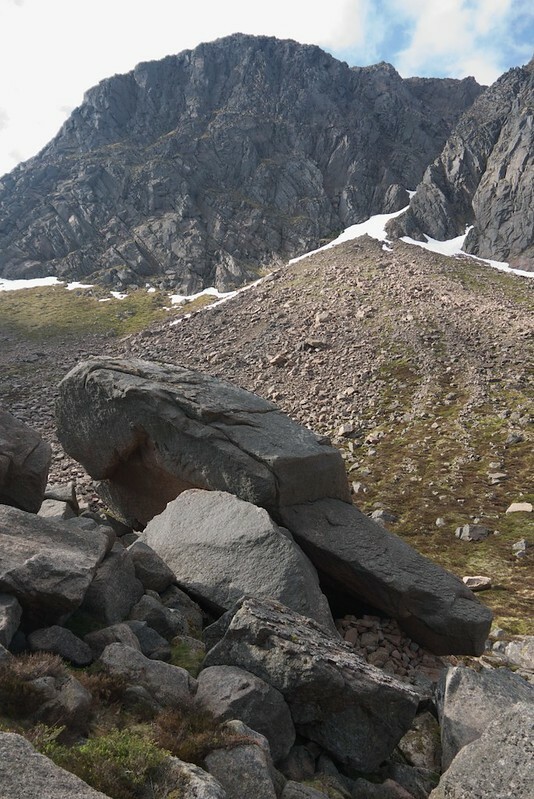 One less beautiful thing about bivvying is the weight of my rucksack on such trips. Despite not carrying a tent, my rucksack still weighed a ton, with food, water, cooking equipment, tarp, and everything else I needed for an overnighter in the hills. 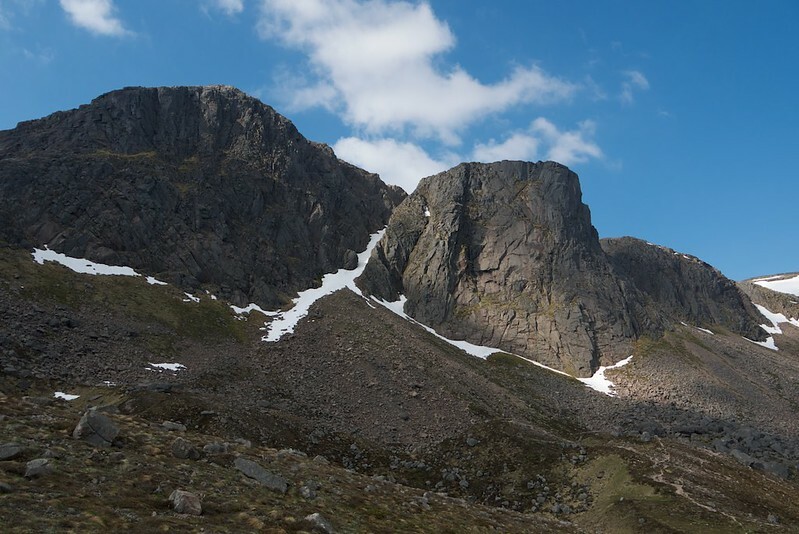 The weather was sublime - just a few clouds in an otherwise blue sky. Sun cream was a necessity. We reached Derry Lodge within an hour and had a rest on a fallen tree, once we were away from the multiple tents that were scattered around the lodge. Then we continued up Glen Derry, towards one of my favourite views - the trio of hills, Sgurr an Lochan Uaine, Stob Coire Etchachan and Beinn Mheadhoin. 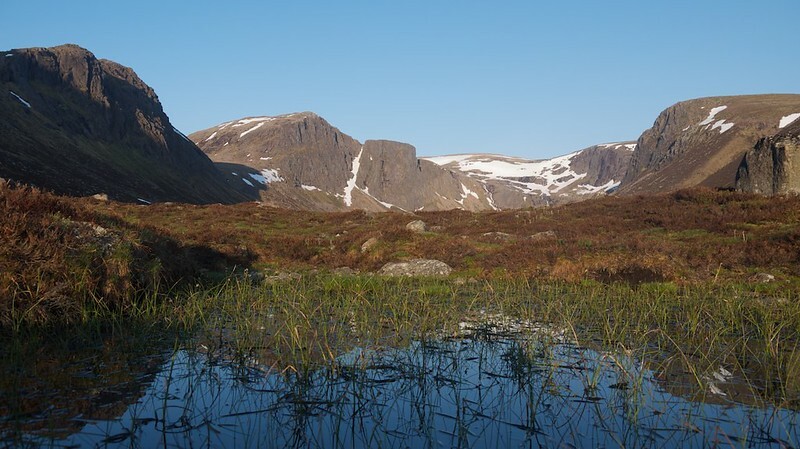 As usual, I faffed around trying to find an easy place to cross the Glas Allt Mor, and eventually just paddled through, trusting my gaiters more than stepping stones to keep my feet dry. 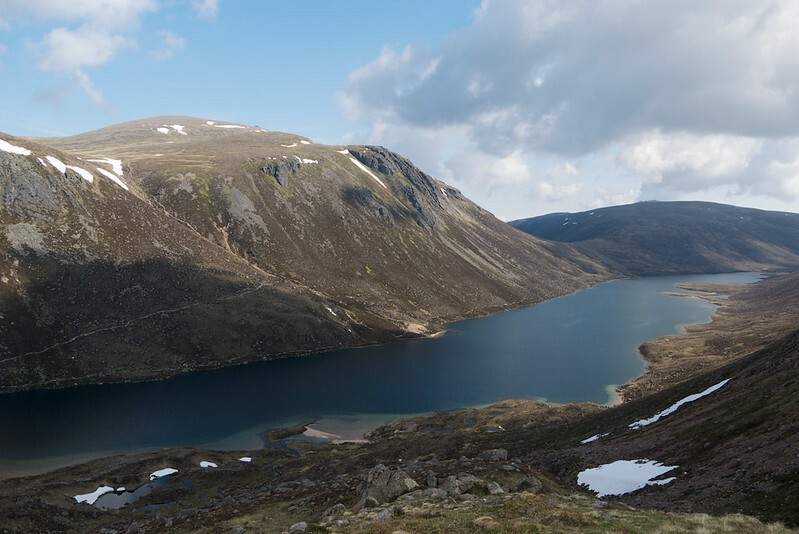 Our initial plan had been to leave our bags near the junction of the track up to the Hutchinson Hut, head up Beinn a' Chaorainn, then retrieve our bags and camp either by the Hut or by Loch Etchachan. 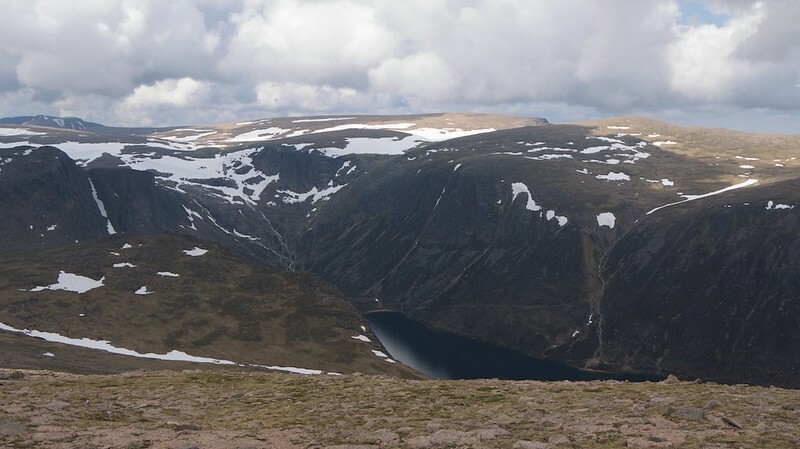 However, we instead decided to keep hold of our bags, ascend that Beinn and then descend its northern slopes and camp either by the Fords of Avon or at Loch Avon. 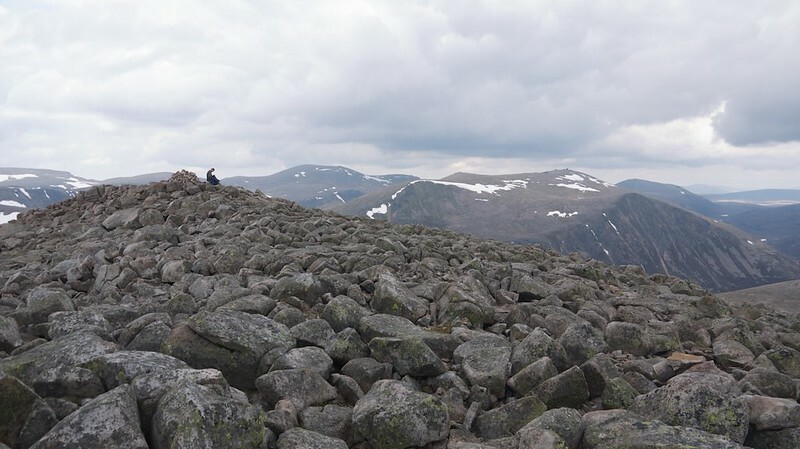 We started to regret our decision half way up Beinn a' Chaorainn - only because it was hard work ascending a hill with heavy rucksacks on our backs! 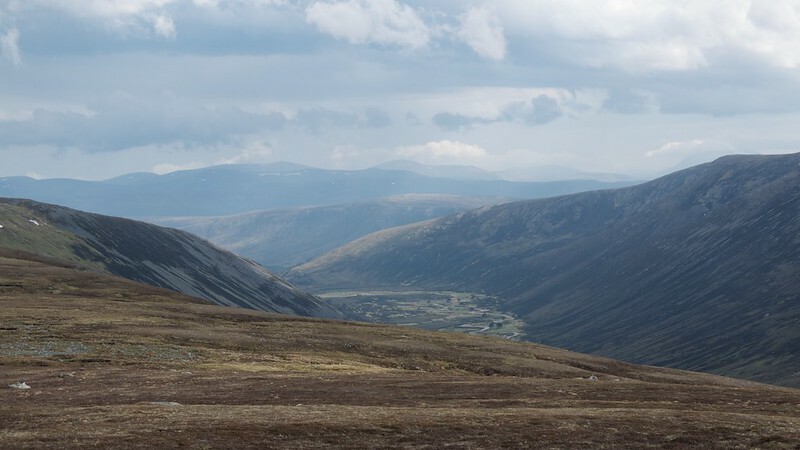 However, our efforts were rewarded higher up where we enjoyed good views down Glen Derry and across to Bheinn Mheadhoin. 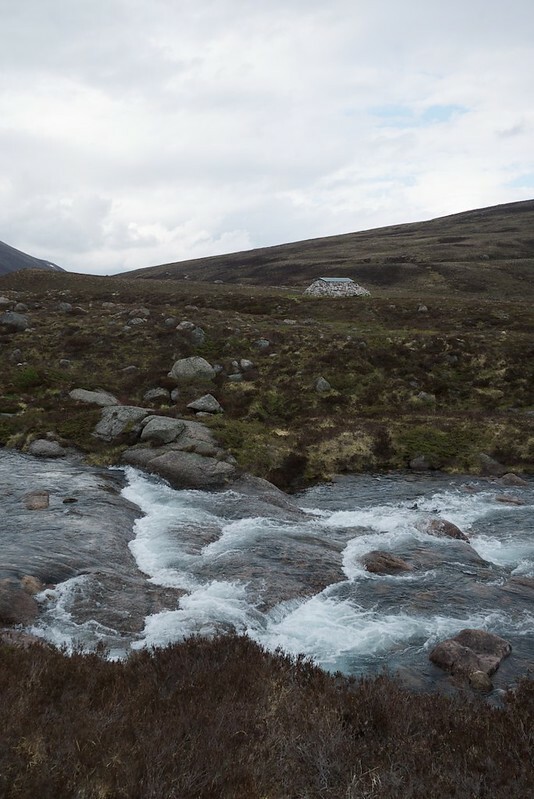 During our descent of the rocky northern slopes we stopped and I set the stove going for a cuppa. 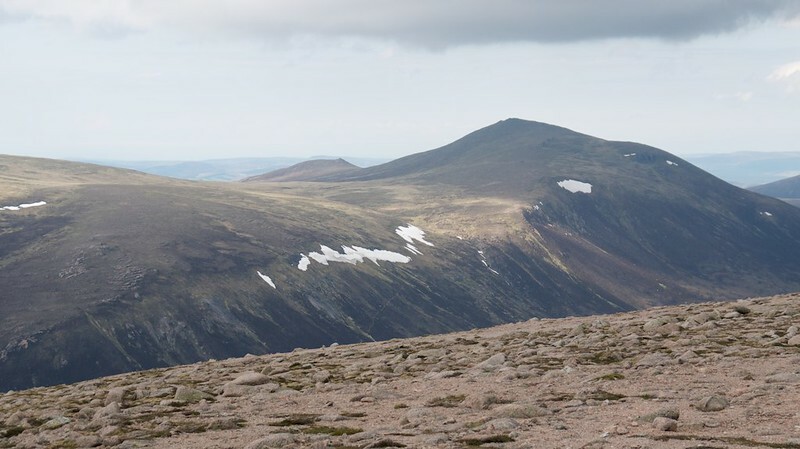 We looked across to Cairn Gorm and down the Laorig an Laoigh. 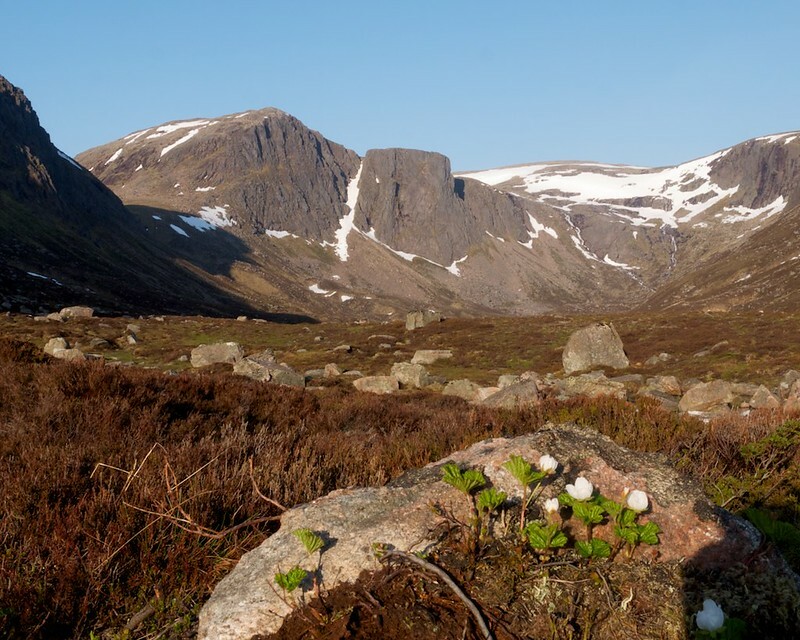 The Corbett Craig Mhor was very inconspicuous, when compared to its neighbour, Bynack More. 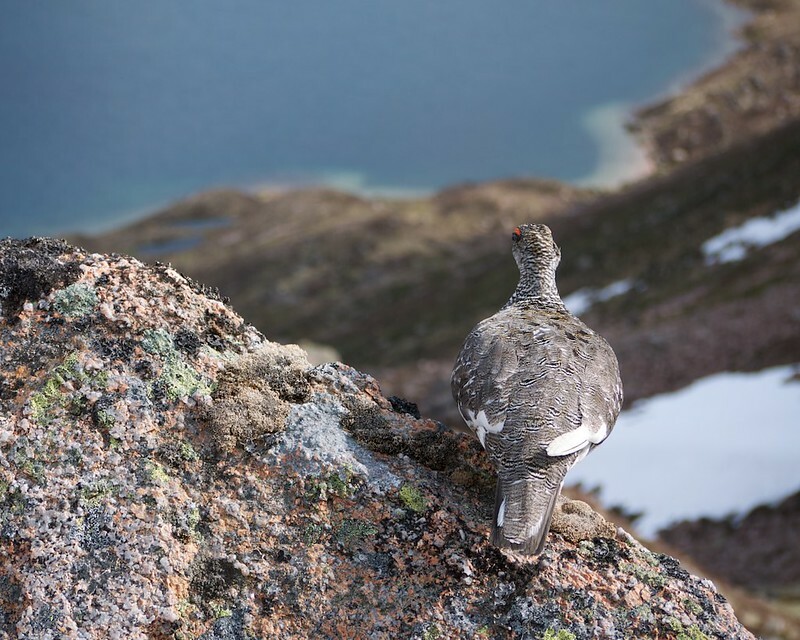 We continued our descent and spotted a ptarmigan amongst the scree - one of many sightings to come during the weekend. We reached flat ground and the path northwards to the Fords of Avon. I decided against crossing the river to visit the Refuge - the water was too deep for my liking! 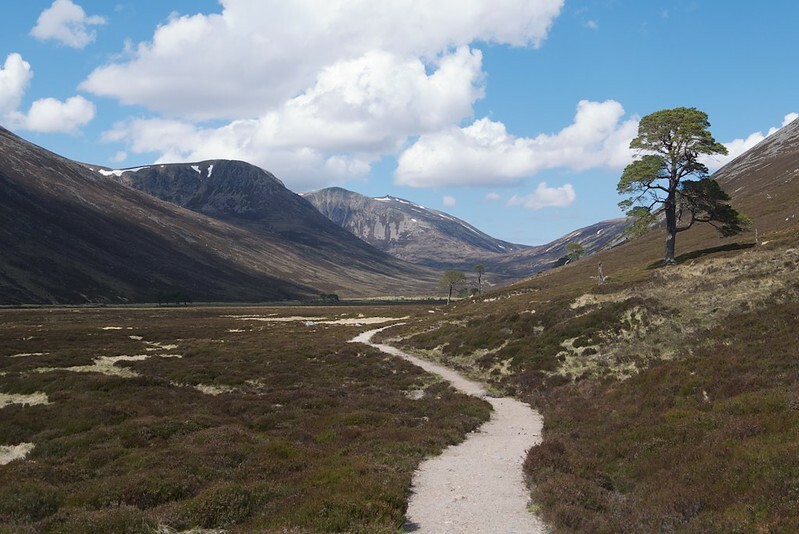 We instead walked along the faint path to the south of the river, west towards Loch Avon. 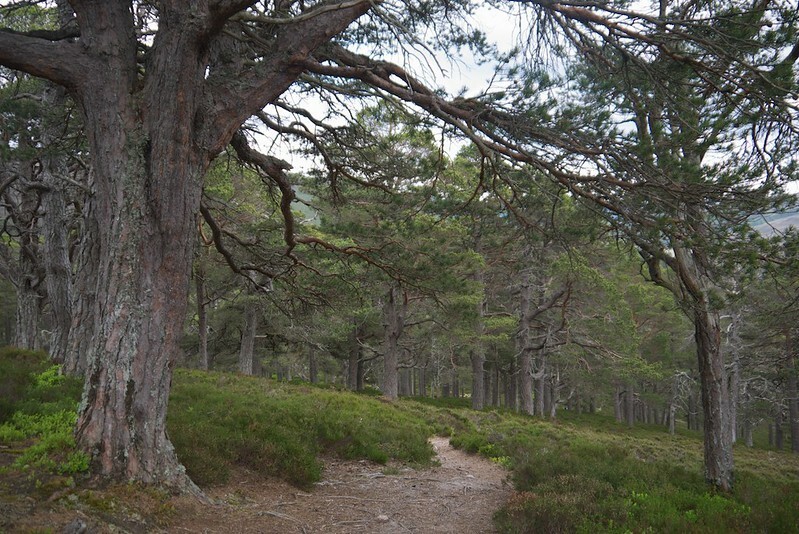 The path was rough and meandering, often high above the river, but eventually we reached the east end of the loch and started along the lochside path to find a suitable dinner spot. 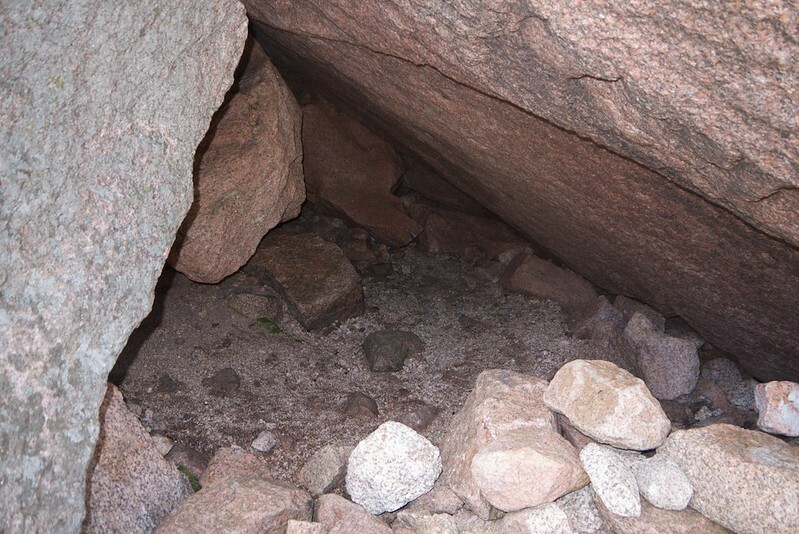 We found one - a gravelly beach beside a lochan. I started to cook the pasta whilst my friend went to refill our bottles at the nearest stream, 500m away. Dinner tasted good. 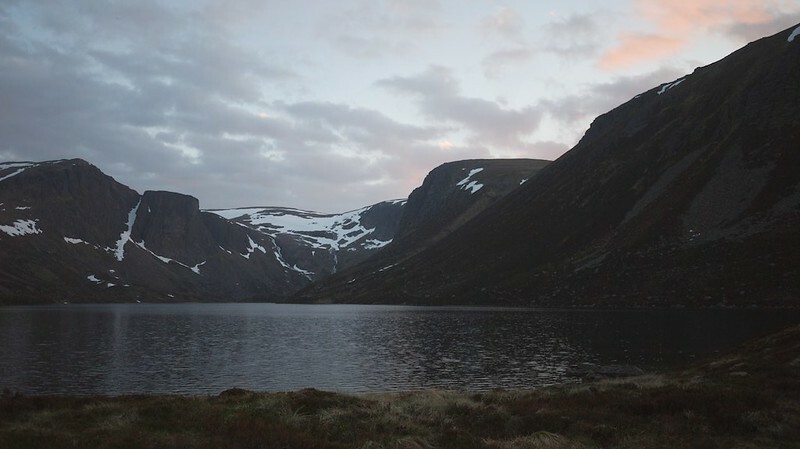 An excellent camping spot, even more picturesque than our dinner spot, was found - a promontory that projected into the loch, that even featured a gravelly beach. An excellent viewpoint. I tried to set up my tarp on the beach itself, but discovered that trying to anchor guy lines in fine gravel is very difficult. It had started to drizzle. I decided to move onto terra firma, and set up my tarp more securely on the grass instead. After a hot chocolate and a whisky, it was time to go to bed. 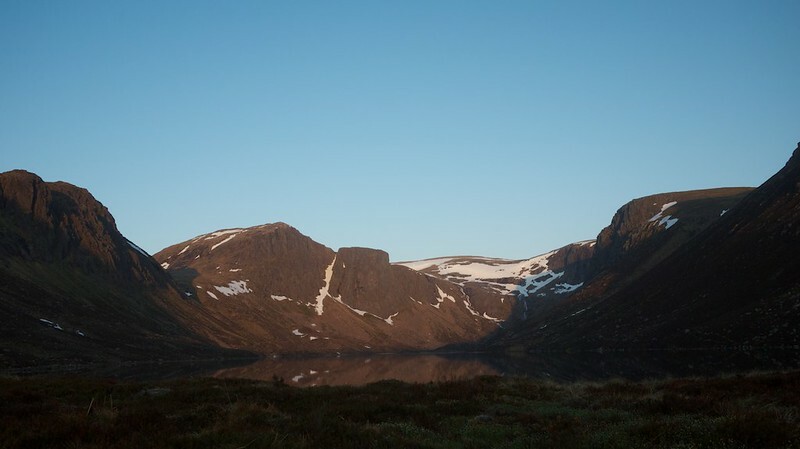 I woke up when it was light at around 4am, and turned round to check on the view. 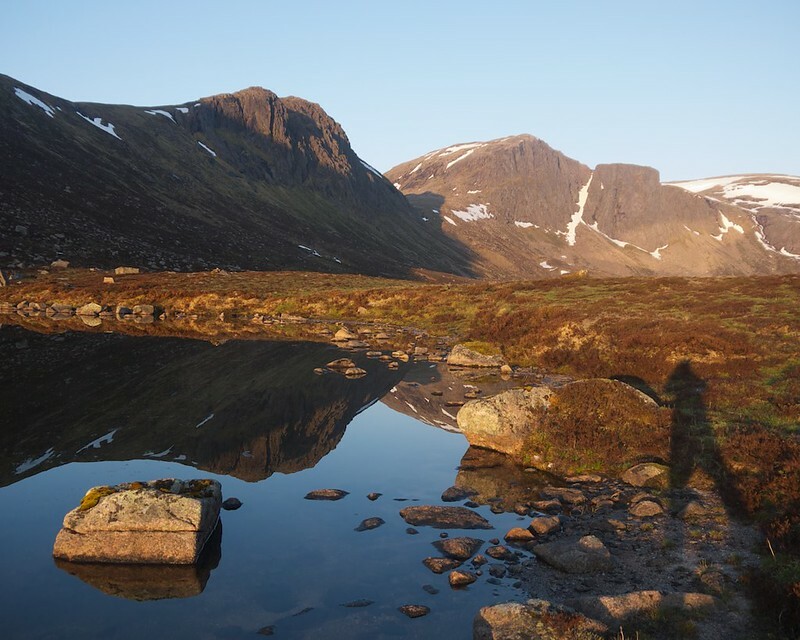 Was the Shelter Stone crag bathed in golden sunlight? No, it was under a grey sky. I then realised that was because the sun hadn't yet risen over the horizon. At 5am things were different. The golden hour had begun in earnest. I took my tarp structure down so that I could lie in my sleeping bag under the wide open sky. There was some frost on the tarp and a lot of condensation. When it had warmed up a bit I got up and wandered around, probably for over an hour, snap-happy in the golden light. I took hundreds of photographs. Breakfast was a leisurely and memorable one, on the beach with an outstanding view. 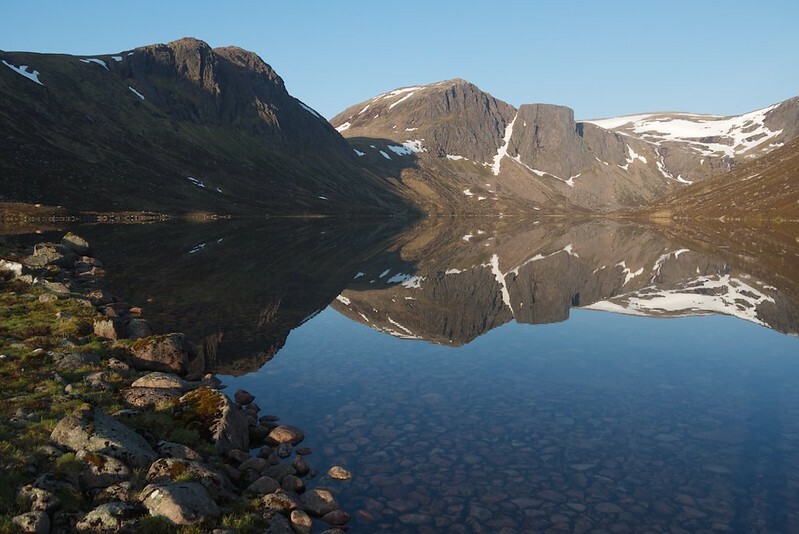 The loch reflected the surrounding mountains almost perfectly. After more photographs, we then packed away our stuff and headed along the path again, towards the western head of the loch. 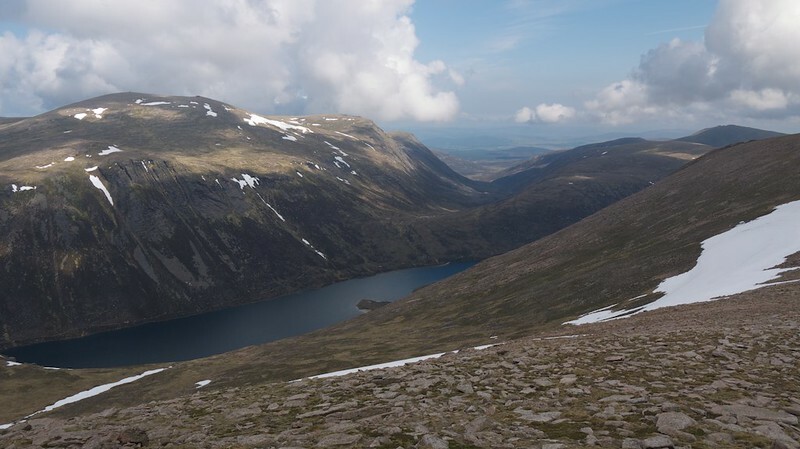 We ascended the steep path, up towards the main path that leads up to Loch Etchachan. 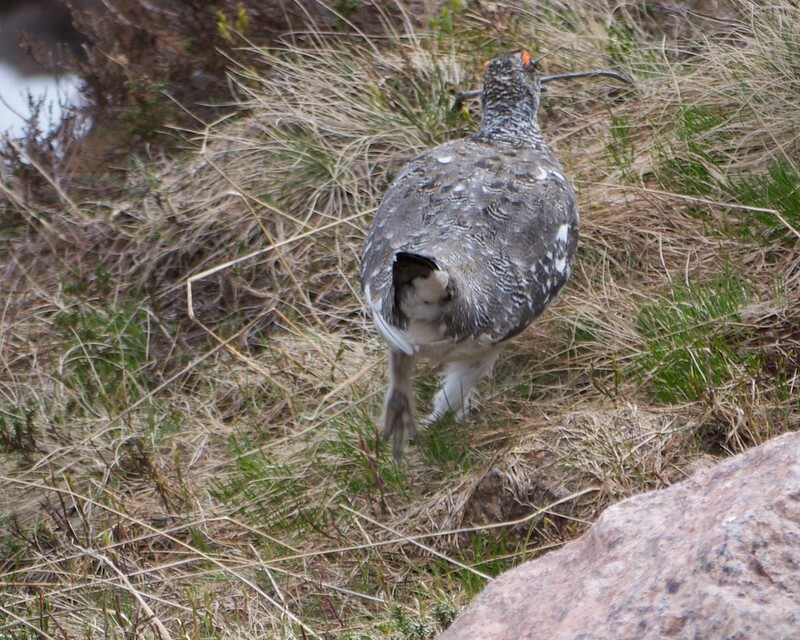 On going round a corner, I spotted a ptarmigan just a few feet away from me. It didn't move away fast, so I managed to take plenty of superzoom shots of it. 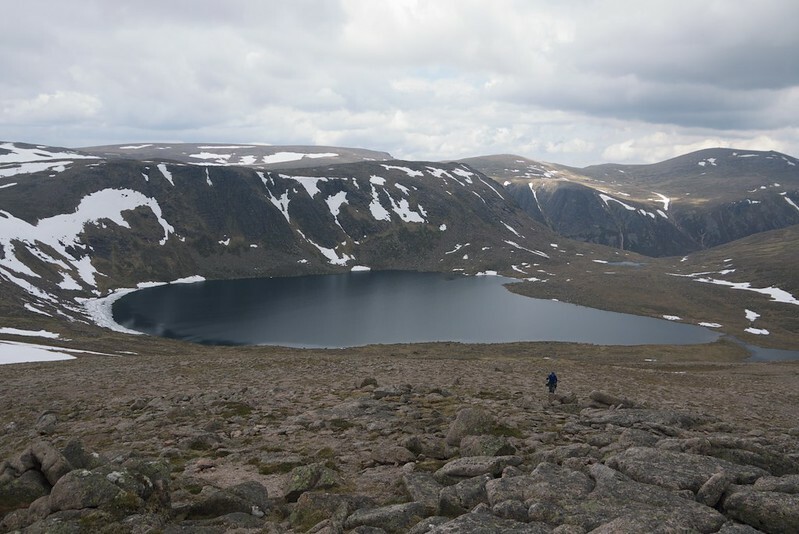 Eventually we reached the top of the Loch Avon basin and made our way across flatter ground to Loch Etchachan. 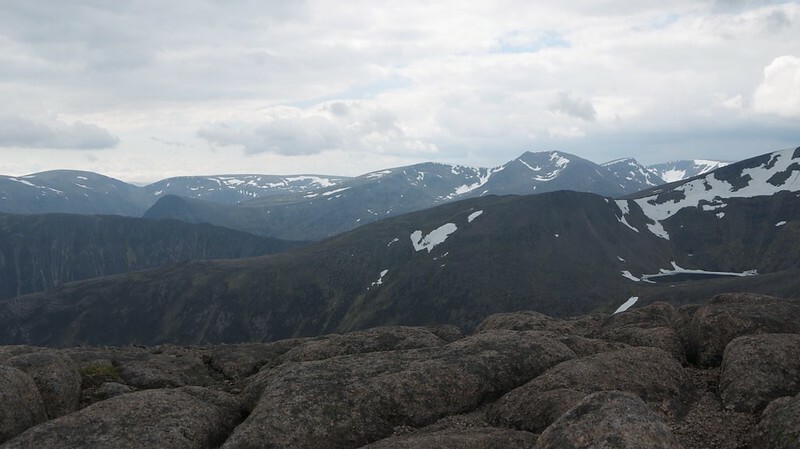 We left our rucksacks tucked under a massive rock and started ascending the gritty slope of Beinn Mheadhoin, soon attaining good views down to the Etchachan lochs, over to Derry Cairngorm, across to Cairngorm, and down to Loch Avon. 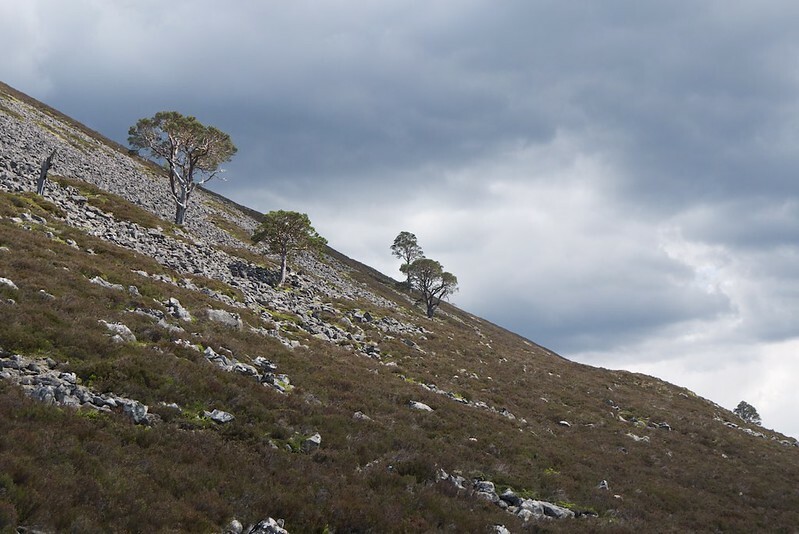 The tors of Beinn Mheadhoin are very impressive and appeared larger than they did when I was last here, in the clag and snow in April 2012. 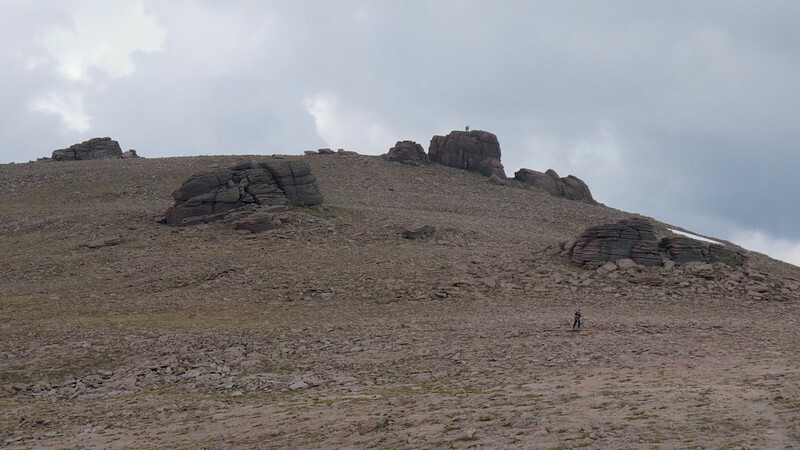 I didn't fancy climbing up the largest tor, so instead opted for a smaller tor nearby. 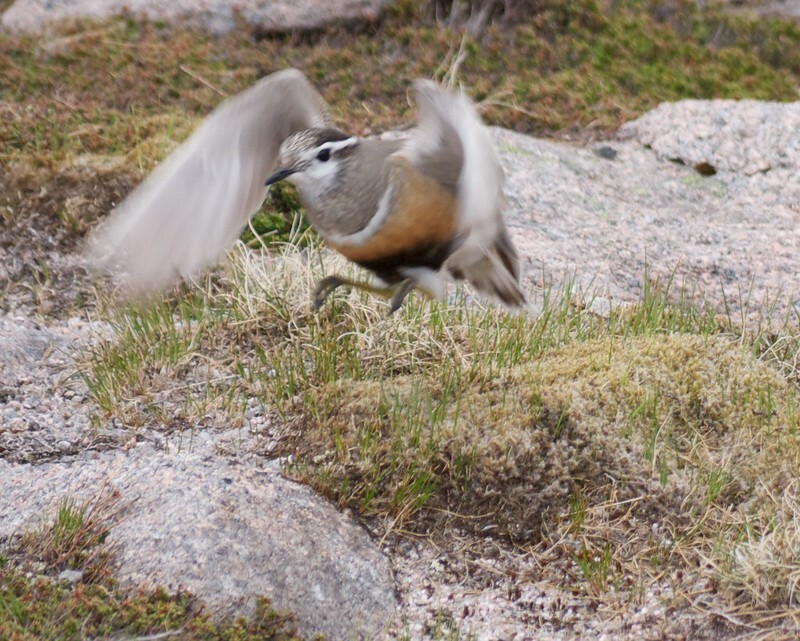 On our descent we were surprised to find a nesting dotterel. 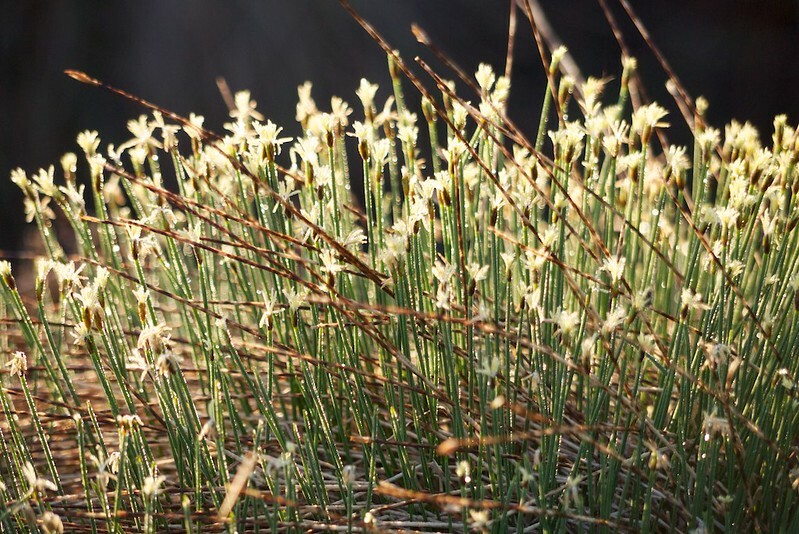 My friend is a keen birder (indeed, a twitcher) and he explained that the male looks after the eggs and chicks alone - the female leaves to find another mate elsewhere. 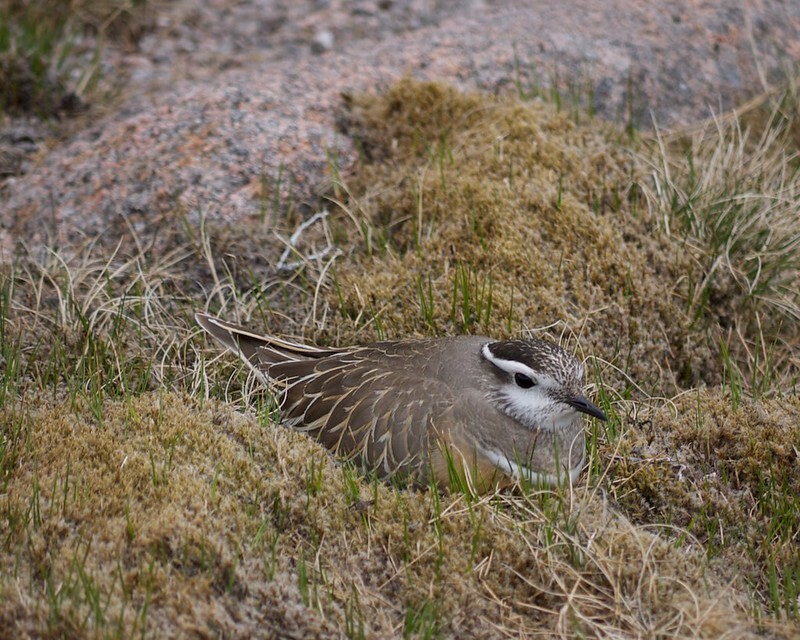 Dotterel and all other plovers are convincing actors - when flushed off the nest, they pretend to be injured to distract potential predators away from the eggs. We retrieved our bags and had another cuppa, then headed across the stepping stones between the Loch and Little Loch Etchachan. I got one of my feet wet, plunging my boot into the water. 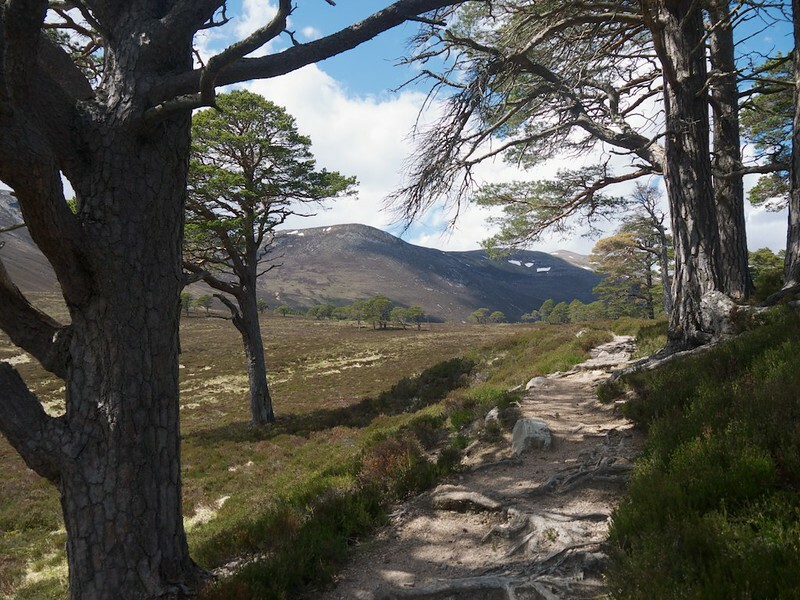 Up the path on the other side and then ascending off piste to Creagan a' Choire Etchachan, then higher, boulder hopping our way up to the summit of Derry Cairngorm. 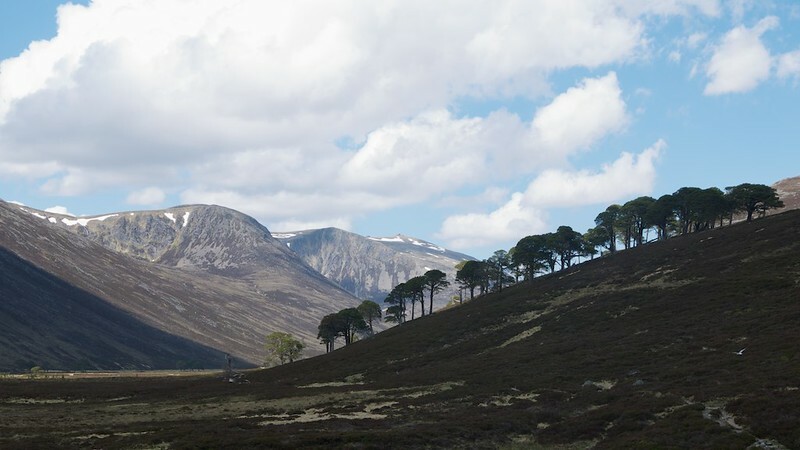 A fine viewpoint of the surrounding hills - a good place to put everything in perspective. 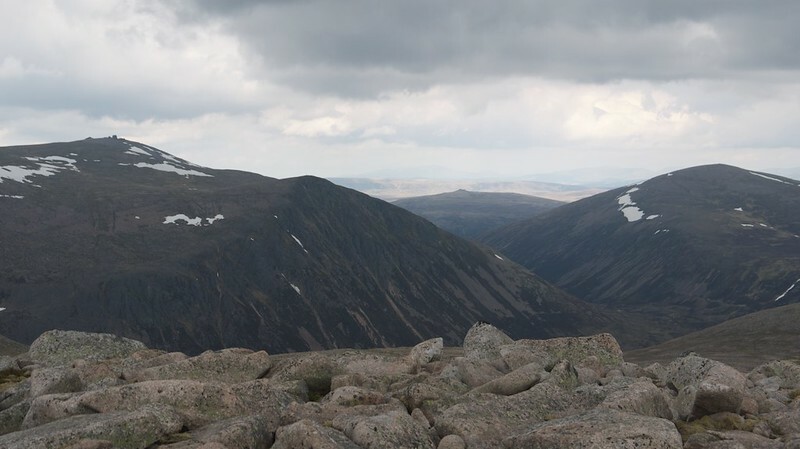 It was then time to make a gradual descent towards the south, over Little Cairngorm then down to Carn Crom. 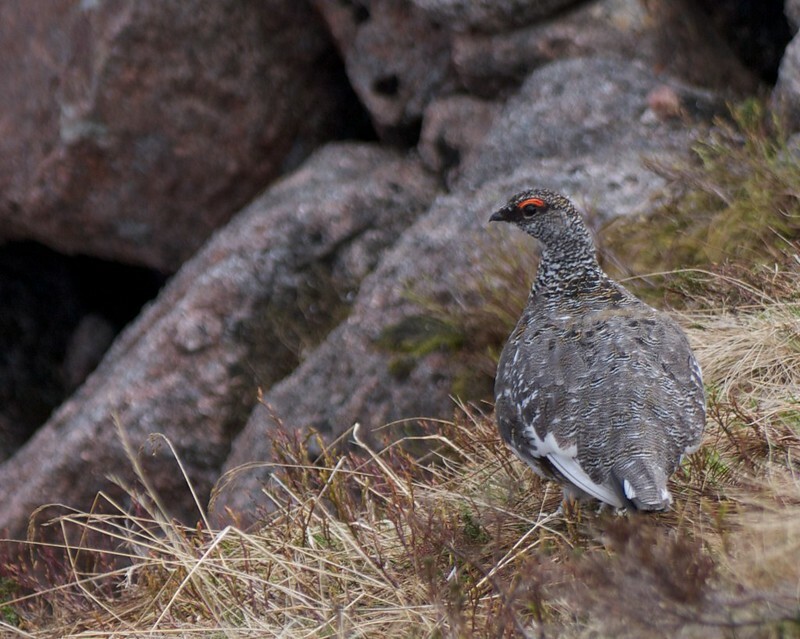 We spotted more ptarmigan on the east side of the hill, and had another cuppa on our way down, stopping at an excellent viewpoint over Glen Derry and Glen Lui. 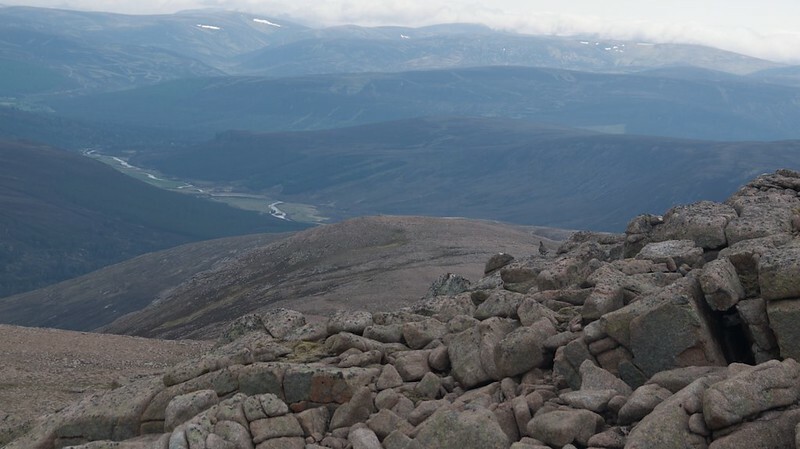 Seems to have been busy in the Cairngorms with Walkhighlanders this weekend . 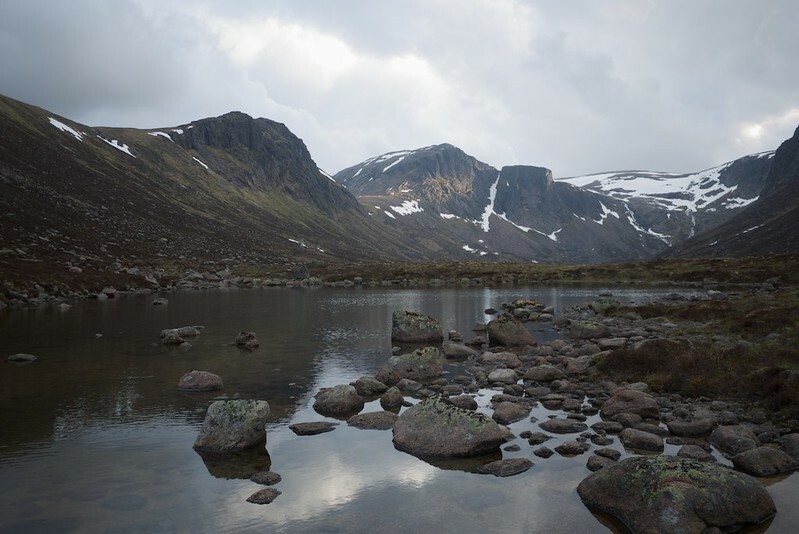 Really enjoyed your report, particularly the morning photos of Loch Avon. I was there about 12 hours later (assuming that was Sunday morning? ), so good to see it at both ends of the day. 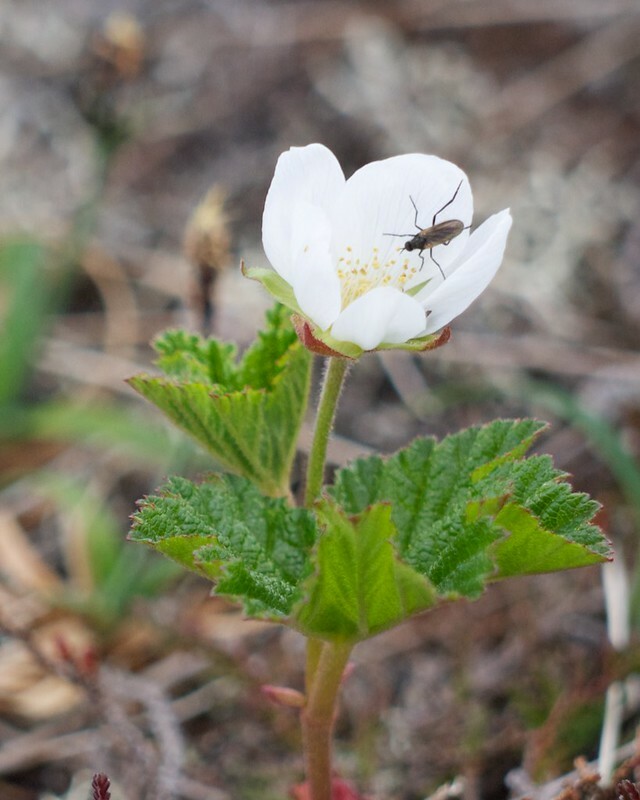 nice trip, great report and pics. love those early morning ones. Extra good pictures. May I ask what camera you used? 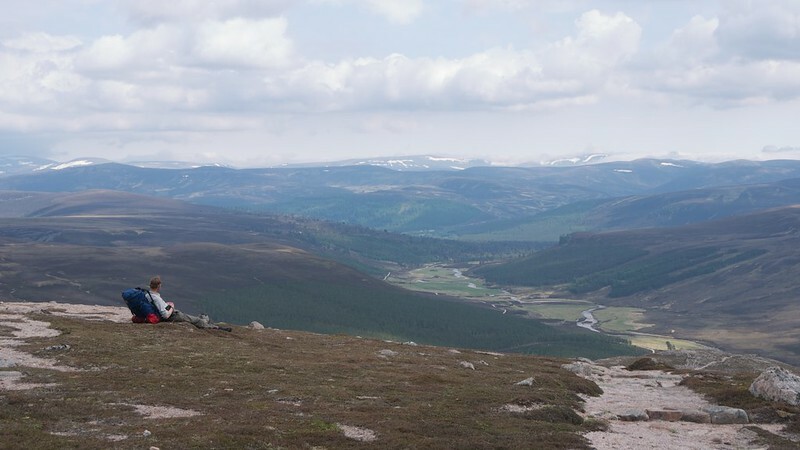 malky_c wrote: Seems to have been busy in the Cairngorms with Walkhighlanders this weekend . 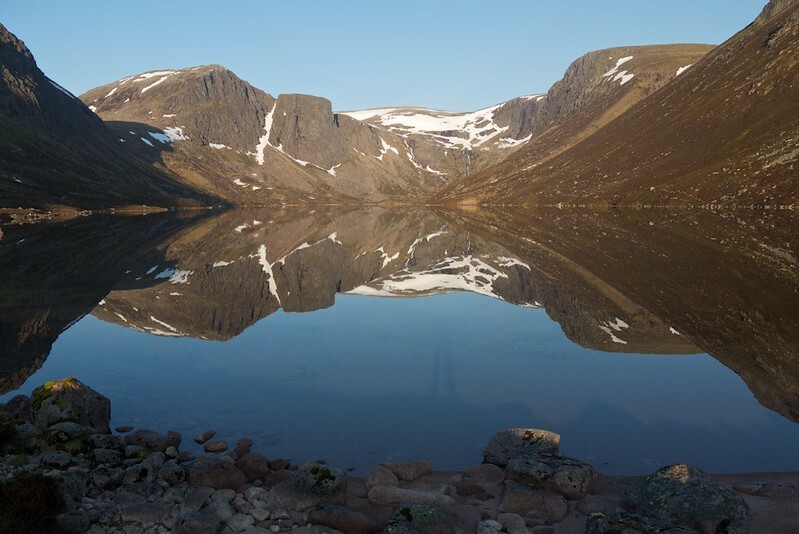 Really enjoyed your report, particularly the morning photos of Loch Avon. I was there about 12 hours later (assuming that was Sunday morning? ), so good to see it at both ends of the day. It does seem to have been busy, yes! 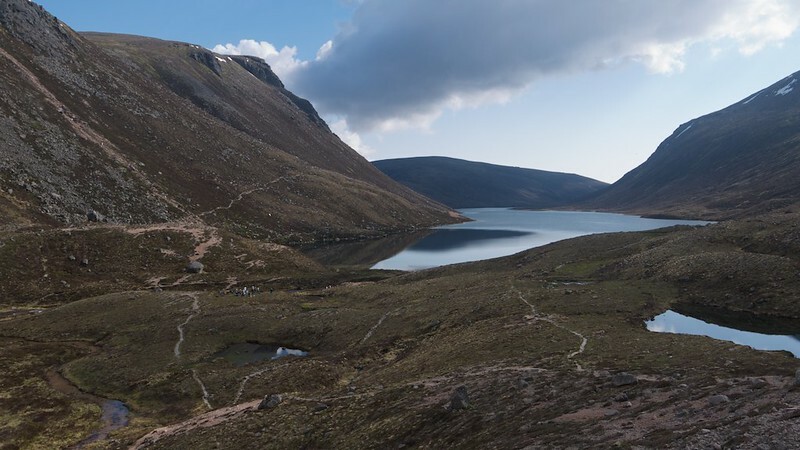 We didn't see too many people, especially in the glens, but I guess that is the advantage of setting off later in the day. 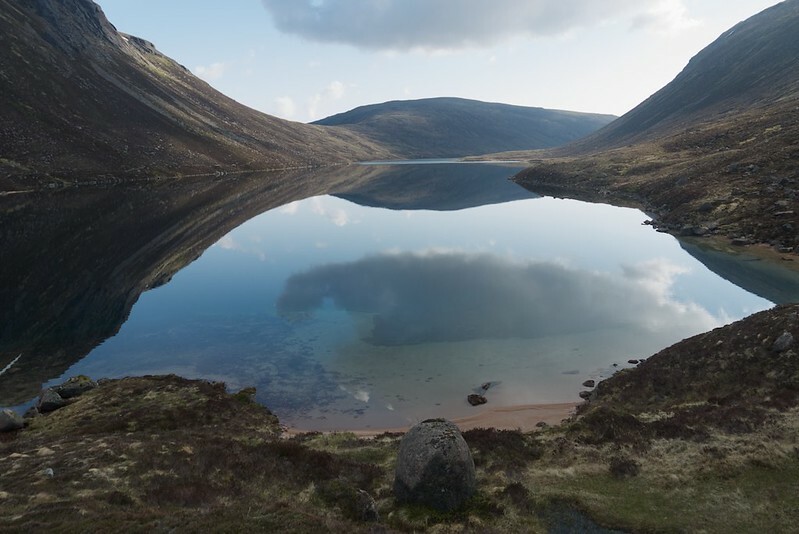 Yes, we were at Loch Avon on the Sunday morning. I will have another read of your report to see how the loch looked in the evening! riverlodge wrote: nice trip, great report and pics. love those early morning ones. litljortindan wrote: Extra good pictures. May I ask what camera you used? Yes, it is a compact system camera - a Panasonic DMC-GF2. Very happy with it, although it would be even better with a viewfinder! Nice photos of birds. 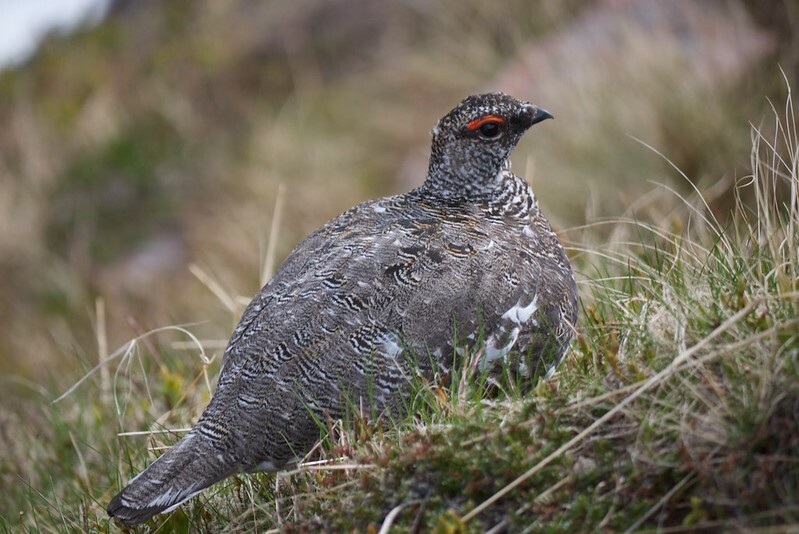 The British Trust for Ornithology is doing a survey of birds in the mountains and would like people to report sightings (with grid refs). You can get the details from their website. bootsandpaddles wrote: Nice photos of birds. 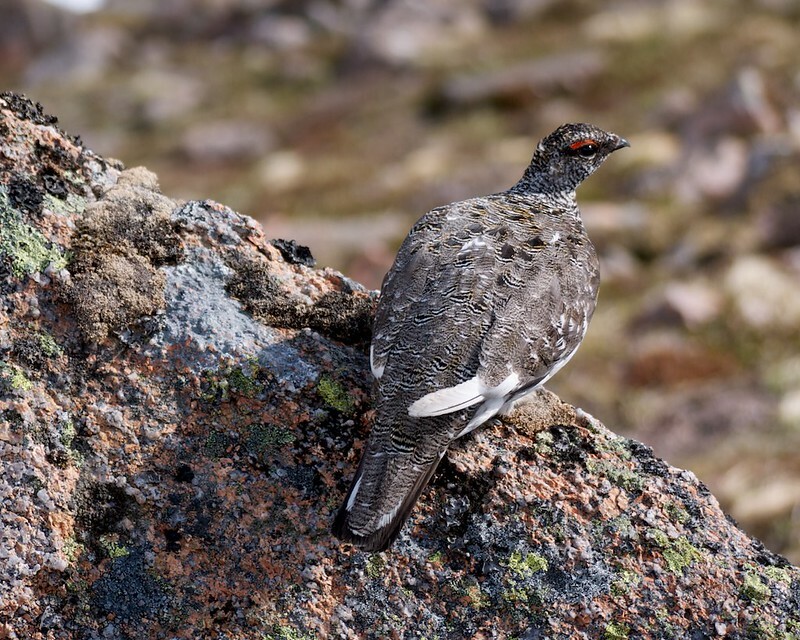 The British Trust for Ornithology is doing a survey of birds in the mountains and would like people to report sightings (with grid refs). You can get the details from their website. 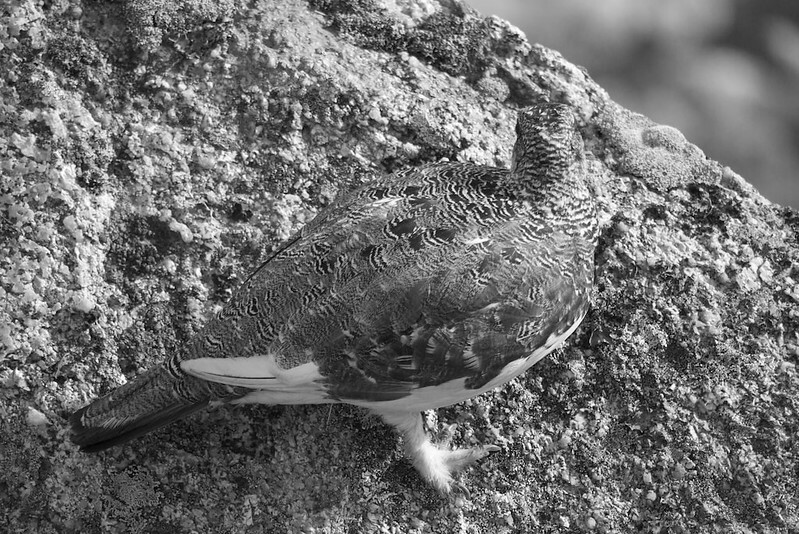 Thanks - I'll have a look at their web site and send the sightings in. 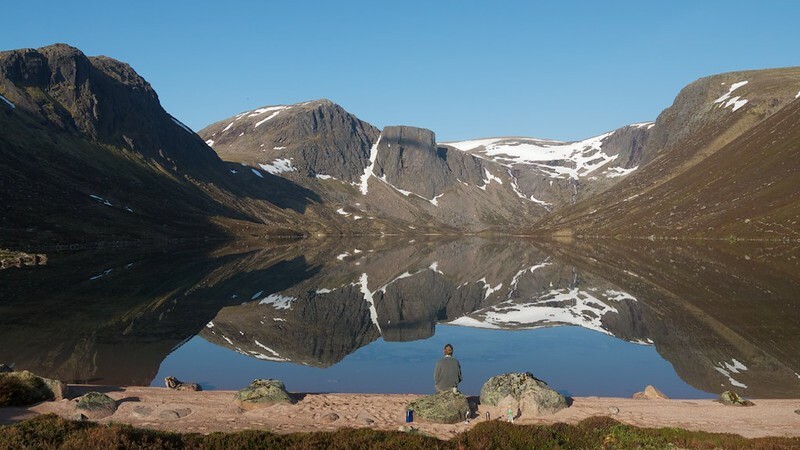 Absolutely fantastic photos... Loch Avon basin is such an amazing amphitheatre.